Oh So Blush – You’re Invited! Little Surprises Event Design is hosting the grand opening of its sister company, Oh So Blush Floral Design Studio, this Wednesday, November 5, 2008 from 5-8:30 p.m. Bring a friend and come see and experience the amazing talent of Rebecca Thai and her team of professionals. Don’t miss the celebration with cocktails and Hors d’ oeuvres by the Skirvin Hilton Hotel Catering! 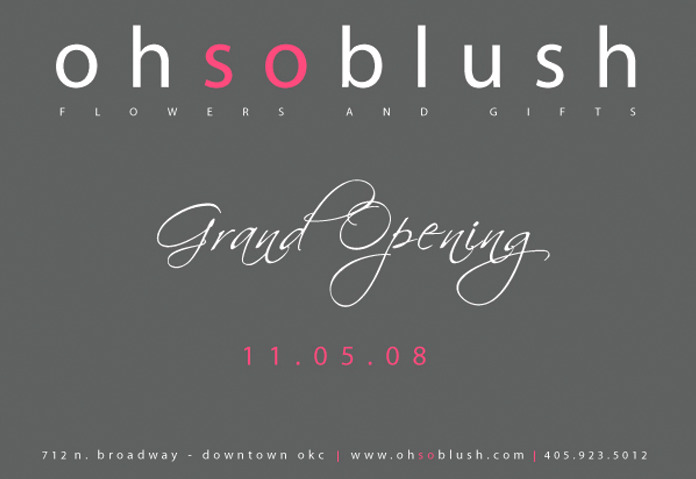 Oh So Blush is located at 712 N. Broadway in downtown Oklahoma City. For more information, visit www.ohsoblush.com.